CMV induces the expansion of a unique subset of human NK cells expressing high levels of the activating CD94-NKG2C receptor that persist after control of the infection. We investigated whether this subset is CMV specific or is also responsive to acute infection with EBV. We describe a longitudinal study of CMV− and CMV+ students who were acutely infected with EBV. The NKG2Chi NK subset was not expanded by EBV infection. 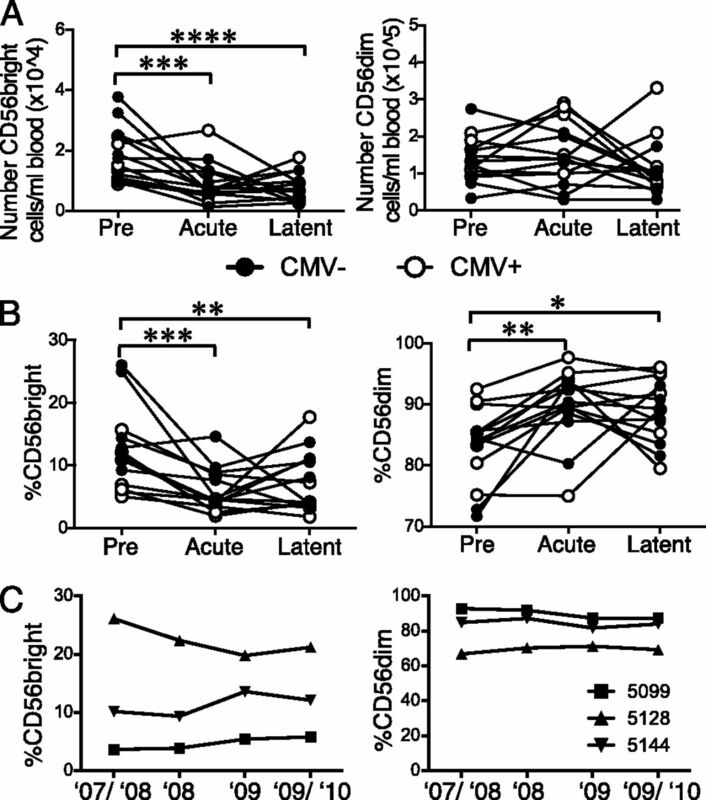 However, EBV infection caused a decrease in the absolute number of immature CD56brightCD16− NK cells in the blood and, in CMV+ individuals, induced an increased frequency of mature CD56dimNKG2A+CD57+ NK cells in the blood that persisted into latency. These results provide further evidence that NKG2C+ NK cells are CMV specific and suggest that EBV infection alters the repertoire of NK cells in the blood. The human herpesvirus family, including CMV and EBV, comprises ubiquitous human pathogens that infect a majority of the world’s population. These viruses have coevolved with their human host, usually causing asymptomatic primary infection after which the virus goes latent and persists for the lifetime of the individual (1). However, there are certain populations who are at risk for life-threatening consequences of these viruses, including individuals who are immunocompromised because of hematopoietic stem cell transplantation (HSCT), solid organ transplantation, cancer treatment, or HIV infection. In addition, pregnant women who contract CMV can pass the infection to the fetus, often resulting in birth defects (2). NK cells play a significant role in the immune response against viral infection. Their importance is underscored by rare individuals who are selectively deficient in NK cells and are highly susceptible to herpesviruses, including CMV, EBV, and varicella zoster virus (3). Recently, a unique population of NK cells expressing the CD94-NKG2C receptor at high levels was found in CMV+ but not CMV− individuals (4, 5). These NKG2Chi cells also express CD57, which marks a population of mature NK cells with distinct phenotype and function (6). An increased frequency of NKG2C+ NK cells also was found in CMV+ patients (but not CMV− patients) acutely infected with chikungunya (7) or hantavirus (8), as well as in those chronically infected with HIV-1 (9) or hepatitis B or C (10), indicating that CMV infection is essential for the generation of these NKG2ChiCD57+ NK cells. In addition, these NK cells were expanded after CMV reactivation in patients undergoing HSCT or solid organ transplantation and persisted for >1 y after the acute CMV infection (5, 11, 12). These findings are in line with those from mouse models, in which Ly49H+ NK cells specifically respond to CMV infection (13–15), suggesting that NKG2ChiCD57+ NK cells might similarly be involved in controlling human CMV infection. NKG2C belongs to the NKG2 family of C-type lectin-like receptors expressed by NK cells and some T cells (16). Members of this family form heterodimers with CD94 and transmit inhibitory or activating signals, depending on the receptor. NKG2C is an activating member of the family, associating with the ITAM-containing adaptor protein DAP12, whereas NKG2A is an inhibitory receptor, possessing two ITIMs in its cytoplasmic tail (17). Both the CD94-NKG2A and CD94-NKG2C receptors recognize the nonclassical HLA-E molecule, although NKG2A binds with higher affinity than does NKG2C. HLA-E presents leader peptides from classical MHC class I molecules, and recognition by NKG2A transmits an inhibitory signal, protecting healthy cells from attack by NK cells. HLA-E expressed by healthy cells does not trigger activation of CD94-NKG2C+ NK cells, suggesting that alterations in the peptide repertoire of HLA-E during CMV infection might cause the specific expansion of CD94-NKG2C+ NK cells. EBV is another prevalent herpesvirus that typically causes asymptomatic and persistent infection (18). If EBV is not acquired at a young age, it is often contracted when young adults enter college and manifests as infectious mononucleosis (IM) (18, 19). There is growing evidence that NK cells play a role during EBV infection. During acute EBV infection, NK cell numbers are significantly increased (19–21). NK cells exhibit greater cytotoxicity against an EBV-transformed cell line during acute EBV infection (20) and limit EBV viral load, IM symptoms, and tumor formation in a humanized mouse model (21). CD56bright NK cells may control EBV infection and limit transformation of B cells in tonsils and secondary lymphoid tissues (22, 23). A recent study reported an increased frequency of NKG2C+ NK cells in pediatric patients who were both CMV+ and EBV+ compared with those who were only CMV+ (24), suggesting that EBV infection might modulate this NK cell population. Although this study compared groups of children based on CMV and EBV serological status, it did not address the effect of acute EBV infection and latency on this compartment. In this study, we performed a longitudinal analysis of a cohort of EBV-naive university students who experienced acute IM to determine whether CD94-NKG2C+ NK cells are affected by, and whether a unique subset of peripheral blood NK cells responds preferentially to, acute EBV infection. Cryopreserved PBMCs were available from a longitudinal study performed at the University of Minnesota (19, 25). Preinfection, acute infection, and latent EBV infection samples were available for 15 subjects (8 CMV− and 7 CMV+). In addition, blood samples from three CMV− and EBV− individuals (healthy controls) were analyzed. All participants gave informed consent, and the University of Minnesota Institutional Review Board approved all protocols used. To assess function, 5 × 106 PBMCs were recovered overnight in a 37°C incubator in RP10 medium (RPMI 1640 [Corning] supplemented with 10% heat-inactivated FBS [HyClone], l-glutamine, penicillin, streptomycin [Corning], and 200 U/ml recombinant human IL-2 [National Cancer Institute Biological Repository]). NK cell degranulation was induced by coculture (1:1 ratio) with the MHC class I–deficient EBV-transformed B lymphoblastoid cell line, 721.221, with FITC-conjugated mouse anti-human CD107a (BioLegend) and GolgiStop (BD Biosciences) in 96-well flat-bottom plates in a 37°C incubator with 5% CO2. After 4 h, cells were harvested and stained with fluorochrome-conjugated Abs against CD3, CD56, CD16, CD57, NKG2C, NKG2A, NKG2D, KIR2DL2/DS2/3 (DX27), KIR3DL1 (DX9), KIR3DL2 (DX31), and KIR2DL1/DS1 (EB6) (5). Cells were analyzed on a BD LSR II flow cytometer (BD Biosciences) using FlowJo software (TreeStar). Statistical analysis was performed, using either one-way or two-way ANOVA with a Tukey posttest, with Prism software (GraphPad). The p values ≤ 0.05 were considered significant. We analyzed the phenotype of NK cells for 15 individuals who were EBV naive and experienced IM during college. Subject information is provided in Table I. Of the seven CMV+ individuals, three had an expanded NKG2ChiCD57+ subset in the CD56dimCD16+ NK cell population before EBV infection, whereas none of the CMV− individuals exhibited this phenotype (Fig. 1A). Individual 5186 does not express NKG2C and may have homozygous deletion of this gene, a trait found in ∼4% of the general population (26). The frequency of NKG2ChiCD57+ NK cells was remarkably stable (Fig. 1B). Acute EBV infection did not induce the expansion of the NKG2ChiCD57+ NK cell subset in either CMV+ or CMV− individuals nor did this population change during EBV latency, up to 939 d post-IM. In two of the three CMV+ individuals with the NKG2ChiCD57+ subset, the frequency of these cells decreased during acute infection but returned to preinfection levels in latency. EBV viremia during acute infection did not show any correlation with the frequency of NKG2ChiCD57+ NK cells in either CMV− or CMV+ individuals (data not shown). The frequency of NKG2CdimCD57− cells in the CD56bright immature NK cell population, which we hypothesize are the progenitors of the NKG2Chi NK cells that expand and acquire CD57 during CMV infection, was stable during EBV infection and into latency (Fig. 1C). We analyzed NKG2C expression in a small cohort of three rare individuals who were CMV− and EBV− (healthy controls) and found, as expected, very stable expression even over a 2.5-y period (Supplemental Fig. 1). Taken together, these data demonstrate that expansion of the NKG2ChiCD57+ NK cell subset is not a general response to herpesvirus infections, but it is CMV specific. Acute EBV infection does not expand the NKG2C+ NK cell compartment. PBMCs from CMV− (n = 8) and CMV+ (n = 7) individuals who contracted EBV were analyzed by flow cytometry for NKG2C and CD57 expression. (A) Representative plots with gates showing the NKG2ChiCD57+ subset in the CD3−CD56dimCD16+ NK cell population from CMV− (upper panel) and CMV+ (lower panel) individuals. Frequency per individual before and during acute and latent EBV infection of CD3−CD56dimCD16+ NK cells that are NKG2ChiCD57+ (B) and CD3−CD56brightCD16− NK cells that are NKG2CdimCD57− (C), graphed by CMV serological status (CMV− [upper panels]; CMV+ [lower panels]). As reported (19), we observed that the frequency of CD8+ T cells increases during EBV infection. Although we did not detect an increase in the frequency of total CD3−CD56+ NK cells, we found a significant decrease in the blood in the absolute number of the immature CD56brightCD16− NK cell population (Fig. 2A), reflected as a decrease in the frequency of CD56bright immature NK cells (Fig. 2B). Although it is unclear from our studies of PBMCs whether this shift is due to maturation or trafficking, Münz and colleagues (22, 23) reported that the CD56bright NK cell subset is important for controlling infection in the tonsils, suggesting that these cells may be recruited from peripheral blood even into latency. Another study reported an increased frequency of the CD56bright subset in acute IM subjects compared with healthy controls (20). However, our data are based on a prospective cohort for which preinfection, acute IM infection, and latent infection samples were analyzed; this may account for the discrepancy. In EBV− and CMV− healthy controls, the frequency of both the CD56bright and CD56dim subsets is remarkably stable for ≥2.5 y, suggesting that EBV infection is modulating this population shift (Fig. 2C). We also analyzed expression of NKG2A, the inhibitory counterpart to NKG2C, and CD57 during EBV infection (Fig. 3A). Expression of NKG2A on the immature CD56bright NK cells was stable during infection and into latency, regardless of CMV status (Fig. 3B). In contrast, the frequency of total NKG2A+ NKG2C− NK cells in the mature CD56dim population increased markedly during acute IM, and it remained high in latency in CMV+, but not CMV−, individuals (Fig. 3C). In latency, the population of NKG2A+ cells coexpressing CD57 was significantly higher in CMV+ individuals compared with CMV− individuals and compared with preinfection and acute infection time points (Fig. 3D). However, in healthy controls, the frequencies of NKG2A+ and NKG2A+CD57+ NK cells in the CD56dim population were remarkably stable (Fig. 3E). Taken together, these data indicate that CMV and EBV coinfection induces an increased frequency of a distinct CD56dimNKG2A+CD57+ NK cell population in the blood that persists into latency. The CD56brightCD16− immature NK cell population decreases in EBV infection. 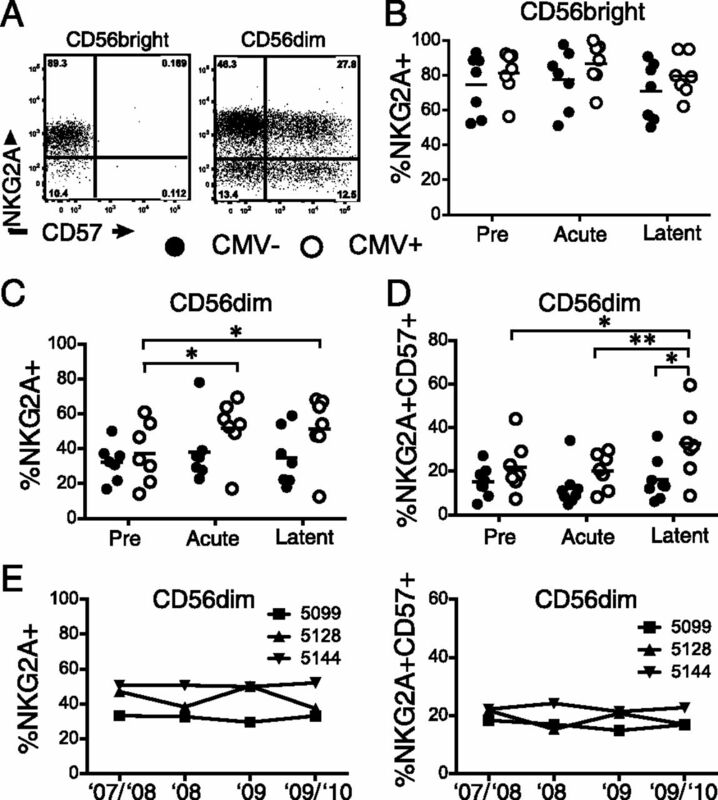 Numbers (A) and percentages of CD3−CD56brightCD16− (left panels) and CD3−CD56dimCD16+ NK cells (right panels) (B and C) from PBMCs. In (A) and (B), data are from CMV− (●; n = 8) and CMV+ (○; n = 7) individuals before (pre), during (acute), and after (latent) EBV infection. In (C), data are from healthy controls (CMV− and EBV−; n = 3) at four time points from 2007 to 2010. *p < 0.05, **p < 0.009, ***p < 0.001, ****p = 0.0001, one-way ANOVA. EBV infection induces a CD56dimNKG2A+CD57+ population in CMV+ individuals. PBMCs from CMV− (n = 8) and CMV+ (n = 7) individuals before (pre), during (acute), and after (latent) EBV infection and from healthy controls (n = 3) were analyzed by flow cytometry for NKG2A and CD57 expression on CD3−CD56+ NK cells. (A) Representative plots showing NKG2A and CD57 expression by CD56bright (left panel) and CD56dim (right panel) NK cells. Frequency of NKG2A expression by CD3−CD56brightCD16− (B) and CD3−CD56dimCD16+ (C) NK cells, as well as frequency of NKG2A+CD57+ NK cells in the CD3−CD56dimCD16+ population (D), from CMV− (●) and CMV+ (○) individuals. (E) Frequency of NKG2A and CD57 expression by CD3−CD56dimCD16+ NK cells from healthy controls. *p < 0.05, **p < 0.007, two-way ANOVA. We examined the cell surface expression of the killer cell Ig-like receptors (KIRs)—KIR2DL2/3/DS2, KIR3DL1, KIR3DL2, and KIR2DL1/DS1—to determine whether there is EBV-specific modulation of these receptors. 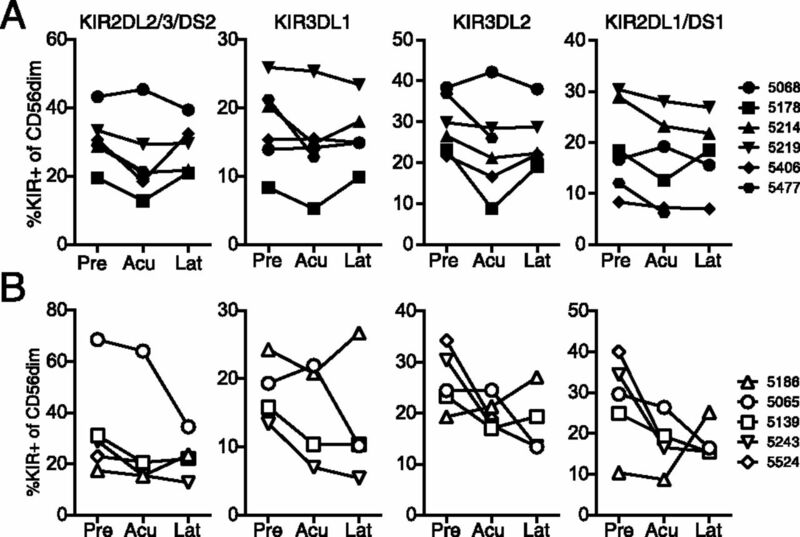 Expression of these KIRs fluctuates during acute IM, regardless of CMV status (Fig. 4), which is likely a reflection of the changing environment in acute infection. In EBV-infected, CMV− individuals, return to baseline KIR expression occurs within a year of infection (latent samples ranged from 333 to 886 d post-IM) (Fig. 4A). For three of the CMV+ individuals, there was a trend toward a decreased frequency of KIR+ cells in latency compared with preinfection (Fig. 4B), indicating that the KIR repertoire is still altered up to 939 d postinfection. These data are in line with those of Malmberg and colleagues (27), suggesting that CMV infection alters the KIR repertoire and that this phenotype is stable for up to 4 y. Although they found that these alterations are not seen in CMV− individuals, even those who are EBV+, our data suggest that coinfection further alters KIR expression. KIR expression on NK cells from healthy controls was stable (Supplemental Fig. 2). Nevertheless, there was no expansion of a unique KIR subset during EBV infection, suggesting that these KIRs are not specifically involved in the response to EBV infection. EBV infection does not induce expansion of a specific KIR subset. PBMCs from CMV− (n = 6) (A) and CMV+ (n = 5) (B) individuals before (Pre), during (Acu), and after (Lat) EBV infection were analyzed for expression of the KIRs—KIR2DL2/3/DS2, KIR3DL1, KIR3DL2, and KIR2DL1/DS1—by CD3−CD56dimCD16+ NK cells. Graphs show the percentage of KIR+ cells for each individual at preinfection, acute infection, and latent infection time points. The persistence of NKG2ChiCD57+ cells in CMV+ individuals suggests that these may be a population of long-lived NK cells involved in controlling CMV. In support of this, Miller and colleagues (11) showed that, after HSCT, NKG2Chi NK cells expand in response to CMV reactivation. It is unknown whether NKG2Chi or NKG2A+CD57+ NK cells respond with more potent function after infection with EBV. To test this, we cocultured NK cells with the EBV-transformed cell line 721.221 and measured degranulation by CD107a expression (Fig. 5A). Because of the heterogeneity of the response from individual to individual, we calculated the ratio of CD107a expression in the NKG2ChiCD57+ or the NKG2A+CD57+ NK cell subsets to that of the total NK population. Before and after acute EBV infection, and regardless of CMV status, a similar proportion of NKG2ChiCD57+ (Fig. 5B) or NKG2A+CD57+ (Fig. 5C) NK cells degranulated in response to EBV-transformed targets. These data suggest that acute EBV infection does not modulate the function of these NK cell subsets. NKG2ChiCD57+ and NKG2A+CD57+ NK cells exhibit similar function before and after EBV infection. PBMCs were cocultured with the EBV-transformed cell line 721.221 or were left unstimulated and stained with CD107a to assess degranulation by total, NKG2ChiCD57+, and NKG2A+CD57+ NK cells in the CD3−CD56dimCD16+ population. (A) Representative plots showing CD107a expression by unstimulated (Unstim) or stimulated (+721.221) total NK cells (upper panels), NKG2ChiCD57+ NK cells (lower left panel), and NKG2A+CD57+ NK cells (lower right panel). Ratio of CD107a expression by NKG2ChiCD57+ NK cells (B) and NKG2A+CD57+ NK cells (C) to that of total NK cells for each individual before (Pre), during (Acu), and after (Lat) EBV infection. Ratios were determined by dividing the percentage of CD107a+ NKG2ChiCD57+ or NKG2A+CD57+ cells by the percentage of CD107a+ total NK cells. In summary, these data provide strong evidence that the NKG2ChiCD57+ NK cell subset is specific for CMV infection and is not a generalized response to herpesvirus infections. It is surprising that the frequency of NKG2A+CD57+ NK cells is higher only in CMV+ individuals. Along with the decrease in KIR+ NK cell frequency, these data suggest that coinfection alters the repertoire, with an increased population of KIR− NK cells in the blood. The frequency of NKG2A+CD57+ NK cells in the KIR− subset is higher than in cells expressing one or more KIRs only in CMV+ individuals (D.W. Hendricks, unpublished observations), suggesting that NKG2A may be licensing these cells in the absence of inhibitory KIR expression, and CD57 is marking their prior expansion in response to EBV infection. These longitudinal studies clearly show that EBV infection can affect the NK cell repertoire and suggest that persistent infection with EBV may have long-term effects on the NK cell population in the individual. We thank nurses Julie Ed, Beth Mullen, and Jennifer Knight for technical assistance and the Lanier laboratory for comments and discussions. This work was supported by National Institutes of Health Grant AI068129 (to L.L.L.). D.W.H. is supported by an American Lung Association Senior Research Training Fellowship, and S.K.D. is supported by National Institutes of Health Grant T32 AI007313.
. 2013. Immune regulation of human herpesviruses and its implications for human transplantation. Am. J. Transplant. 13(Suppl. 3): 9–23, quiz 23.
. 2009. Immunobiology of human cytomegalovirus: from bench to bedside. Clin. Microbiol. Rev. 22: 76–98. 2002. Human natural killer cell deficiencies and susceptibility to infection. Microbes Infect. 4: 1545–1558.
. 2011. Unconventional repertoire profile is imprinted during acute chikungunya infection for natural killer cells polarization toward cytotoxicity. PLoS Pathog. 7: e1002268.
. 2011. Rapid expansion and long-term persistence of elevated NK cell numbers in humans infected with hantavirus. J. Exp. Med. 208: 13–21.
. 2006. Human cytomegalovirus infection is associated with increased proportions of NK cells that express the CD94/NKG2C receptor in aviremic HIV-1-positive patients. J. Infect. Dis. 194: 38–41.
. 2012. Cytomegalovirus reactivation after allogeneic transplantation promotes a lasting increase in educated NKG2C+ natural killer cells with potent function. Blood 119: 2665–2674.
. 2012. Human cytomegalovirus (CMV)-induced memory-like NKG2C(+) NK cells are transplantable and expand in vivo in response to recipient CMV antigen. J. Immunol. 189: 5082–5088.
. 2002. Direct recognition of cytomegalovirus by activating and inhibitory NK cell receptors. Science 296: 1323–1326.
. 2001. Specific and nonspecific NK cell activation during virus infection. Nat. Immunol. 2: 951–956.
. 2002. Recognition of a virus-encoded ligand by a natural killer cell activation receptor. Proc. Natl. Acad. Sci. USA 99: 8826–8831. 2005. NK cell recognition. Annu. Rev. Immunol. 23: 225–274. 2009. DAP10- and DAP12-associated receptors in innate immunity. Immunol. Rev. 227: 150–160. 2011. Progress and problems in understanding and managing primary Epstein-Barr virus infections. Clin. Microbiol. Rev. 24: 193–209.
. 2005. The immune response to primary EBV infection: a role for natural killer cells. Br. J. Haematol. 129: 266–274.
. 2013. Human natural killer cells prevent infectious mononucleosis features by targeting lytic Epstein-Barr virus infection. Cell. Rep. 5: 1489–1498.
. 2008. Tonsilar NK cells restrict B cell transformation by the Epstein-Barr virus via IFN-γ. PLoS Pathog. 4: e27.
. 2013. A distinct subpopulation of human NK cells restricts B cell transformation by EBV. J. Immunol. 191: 4989–4995. Saghafian-Hedengren, S., E. Sohlberg, J. Theorell, C. Carvalho-Queiroz, N. Nagy, J.-O. Persson, C. Nilsson, Y. T. Bryceson, and E. Sverremark-Ekström. 2013. Epstein-Barr virus coinfection in children boosts cytomegalovirus-induced differentiation of natural killer cells. J. Virol. 87: 13446–13455.
. 2012. Primary Epstein-Barr virus infection does not erode preexisting CD8+ T cell memory in humans. J. Exp. Med. 209: 471–478.
. 2004. Molecular genetic analyses of human NKG2C (KLRC2) gene deletion. Int. Immunol. 16: 163–168.
. 2013. NK cell responses to cytomegalovirus infection lead to stable imprints in the human KIR repertoire and involve activating KIRs. Blood 121: 2678–2688.